Ever wonder why all of your sailing friends are about the same age? Or why fewer people seem to be sailing these days? Quick, on one side of a blank piece of paper make a list of the top three things that you think kids do in the summer months when they don’t have school, in order of time spent, most first. Don’t think too hard. Just write the things that pop into your head. Now, on the other side make another list, this time name the top three things that parents do in the summer. If you’re like most Americans, your lists may look something like this, and they explain a lot. This is the American Family in the 21st Century: Kids in front of screens, segregated from parents and mentors who are in cars and cubicles. When outside, kids are within the tight confines of a team-sport. Parents generally don’t get outside. They are working their tails off, and when not working, are coordinating kid schedules or decompressing on the couch. See sailing anywhere in the mix? Seeing clear evidence of these trends in its member demographics and program participation, the Milwaukee Community Sailing Center (MCSC) embarked in 2009 on a multiyear plan to revitalize and modernize sailing by helping families to find it again in new and fun ways. MCSC is a thirty-five year old, not-for-profit, open-to-everyone sailing center that provides lessons and access to a shared fleet of keelboats for free-time sailing. At about $30 a month for an individual membership, it provides lots of sailing for less than most basic cable plans. Kids that start early and learn along with their parents are more likely to continue sailing later in life. Parents that join their kids on the water will have many more chances to share life lessons, mentor and remain connected. The family may be strengthened by shared time, and this will benefit the center and the community. It’s a major shift, requiring innovative thinking. For example, MCSC has found that pressures on family free time are even greater than it expected. It’s simply very hard, without ample time to plan and flexibility in schedules, to find blocks of consecutive hours to sail together. Evenings are tough if dad is stuck in traffic. Saturdays are jam-packed with all the other kids-sports. So MCSC started slowly in 2009 with “parent day.” In special youth classes, parents can elect to go out on the water to see what the kids have learned. 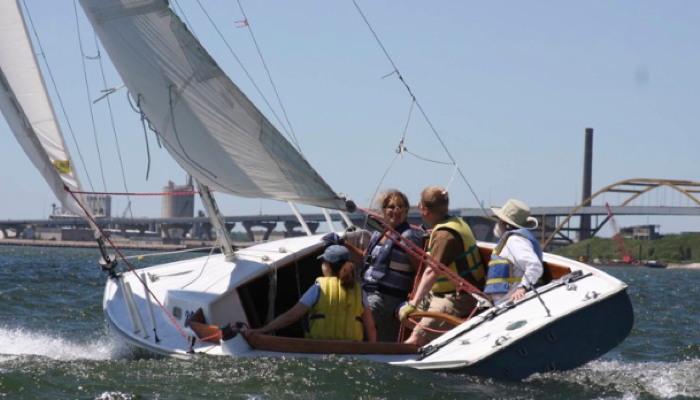 In 2010, MCSC launched its first “Family Learn to Sail” program, pairing families on boats with young-adult counsellors. It is an inexpensive, all-inclusive four afternoon experience designed to build a body of shared family memories by sailing to neat local destinations, taking and sharing photos, and spending almost every minute of class time under sail with all participants driving, trimming and hiking. Family Sports. Designed as a better alternative to team sports where parents can only spectate, this program will show how sailing can be a family sport. Mom/son and dad/daughter teams will participate in sailing games and fun-races. Rebuild-to-own. Designed to teach engineering, glass work, painting, rigging and other useful skills, parent-child wintertime sweat equity to refit donated boats will result in a family owned small-boat fleet at MCSC. BYOB (Bring your own boat) Seminars. Tapping the same family owned boats, this curriculum will teach open water and seamanship skills. Sailing is a perfect family activity, and can last for lifetimes. We are going to show you how. It’s not expensive or inaccessible. We will offer convenient schedules, but you’ll have to commit to invest the time to be with your kids. We will provide top-notch counseling along the way. We will make sure you have everything you need — boats, equipment, safety gear, even clothing. Admittedly, MCSC is facing stiff headwinds: video games, structured sports and long commutes are powerful forces that won’t go away soon. But since drafting the plan to focus on the family, we’ve seen marked changes in the day-to-day operations of the center. While Family Learn-to-Sail class only happens on Sunday afternoons and only on three out of our thirty-three Ensigns, walk-in and free-time sailing traffic of thirty-somethings with school-aged kids is up dramatically. And more grandparent members are bombing around in boats with their grand-kids. Nicholas Hayes is a volunteer at the Milwaukee Community Sailing Center, a member of the Board of Directors, and the chair of its Program Committee. You are currently reading In Milwaukee, Sailing is a Family Thing Again at Saving Sailing.